The auction sold $39 billion in 5-year debt at yields far above what had been anticipated, in the process sinking the value of Treasury bonds. This occurrence is a harbinger of the growing fiscal dangers that are now a full component of the ongoing Global Economic Crisis. The warning is crystal clear. Before the onset of the current financial and economic crisis, the U.S. had structural deficits measured in the hundreds of billions of dollars. Now, however, the fiscally toxic combination of Wall Street bailouts and economic stimulus programs requiring massive public borrowing have created the unprecedented phenomenon of multi-trillion dollar deficits, equal to 15% or more of the entire United States GDP. If would be bad enough if only the U.S. was engaged in such staggeringly high levels of public borrowing. However, virtually every major economy on the globe, including China and Japan, America’s two largest creditors, are also engaging in large deficit-financed stimulus programs. At a time when the U.S. requirement for credit is ballooning, its traditional sources of such largesse are under fiscal pressures of their own. Only by elevating yields on its Treasury bills will the United States be able to attract interest in its ever-expanding menu of Treasury auctions. Raising yields on Treasuries will greatly increase the cost of public borrowing, thus adding to the fiscal imbalance confronting Washington. The growing unease regarding the size of the U.S. deficit by both sovereign wealth funds and private investors, and the real possibility that Washington will lose its coveted AAA status, has implications beyond Treasury yields. Policy decisions that address the nation’s fiscal imbalance may become essential in order to maintain interest in purchasing U.S. public debt instruments. This would mean budget cuts and tax increases, which would greatly increase the likelihood of a double-dip recession. Given the track record of the U.S. political establishment, I suspect that they will delay a serious deliberation on the fast-developing fiscal crisis confronting the public finances of the federal budget until it is too late to avoid the most critical consequences. What the recent Treasury auction demonstrated is that Washington may be fast approaching a situation where insufficient demand exists to satisfy the government’s appetite for borrowed money. What happens then? The most likely result would be monetization of the debt by the Federal Reserve. In effect, the Fed would conjure money out of thin air, and use this newly printed stack of greenbacks to purchase Treasuries that are left behind by global investors and sovereign wealth funds. Should that unhappy day arrive, you can lay the U.S. dollar to rest, for it will not be worth the paper it is printed on. Alan Grayson is a Democratic Congressman representing Florida’s 8th congressional district. He was elected in 2008, having beaten the 4-term Republican incumbent. Despite his freshman status, Grayson is already developing a reputation as a fierce advocate for taxpayer interests in the wake of massive bailouts of the financial sector that have been orchestrated by the Treasury Department and Federal Reserve. Serving on the Financial Services Committee and subcommittee that deals with capital markets, the congressman, having been a successful entrepreneur, clearly knows how to read a balance sheet and ask relevant questions. Thus, the stage was set when the Florida congressman had the opportunity to question Fed Chairman Ben Bernanke when the latter appeared before Congress to present an update on the economic crisis gripping America and much of the world. Congressman Grayson demanded details from Bernanke on a half trillion dollars in liquidity swaps to foreign central banks undertaken by the Federal Reserve, apparently under the radar and in the dead of night. Demonstrating that he and his staff had done their fact-checking, Grayson noted that in 2007 these swaps with overseas central banks were a mere $24 billion, but had swelled to a staggering $553 billion in 2008 with the onset of the Global Economic Crisis. Half a trillion dollars is a number so grandiose, it defies comprehension unless it is reduced to its ultimate simplicity. These credit swaps that exchanged American dollars for various foreign currencies were done without any consultation with elected officials, and amount to more than $1,800 for every man, woman and child residing in the United States. Under section 14 of the Federal Reserve Act, according to Chairman Bernanke, the Fed’s Open Market Committee (FOMC) can engage in swapping U.S. dollars with foreign central banks without any limitations, at any time, without any requirement for congressional scrutiny. In other words, “Congressman Grayson, why are you wasting my valuable time with these irrelevant questions,” Bernanke seemed to be implying through his frosty demeanour. Never mind that the Federal Reserve Act was originally passed in 1913, nearly a century ago. “Is it safe to say that nobody in 1913 contemplated that a small little group of people would decide to hand out half a trillion dollars to foreigners,” Grayson pointed out. He raised as an example New Zealand, which received $9 billion from the Federal Reserve, an amount equal to $3,000 for every one of that nation’s citizens. The congressman from Florida’s 8th district is to be commended for his focussed inquiries directed at the Fed Chairman, and steadfastness in the face of Bernanke’s evasiveness. More importantly, Grayson raises anew serious questions regarding the unlimited power placed in the hands of the Federal Reserve. The defenders of the Fed’s current position of fiscal omnipotence maintain that its independence from political influence must be preserved. However, the historical record, especially in the last 20 years, clearly shows that the Federal Reserve is influenced politically, either through the executive branch and the power of the President to reappoint the Fed Chairman, or through the large financial institutions on Wall Street, which have a level of access to Fed decision-making not available to any other category of citizens. More importantly, since the onset of the current financial and economic crisis, the Federal Reserve and its chairman have proven to be highly fallible, having made many errors in judgment, not the least being their original overly-optimistic pronouncements when the first tremors from the subprime meltdown arose. Congressman Grayson’s penetrating inquiry serves as a reminder that the ultimate systemic risk to America’s financial system and economic superstructure stems from allowing a small, fallible clique to make speedy decisions involving incalculable sums of public money without any consultation with or checks and balances from the nation’s elected representatives. This is not only fiscal tyranny by any other name; it is a recipe for unintended and disastrous consequences. Nouriel Roubini has consistently stated that he expected the current recession-by far the worst America has experienced since World War II- to terminate by the close of the year. This has been his longstanding forecast. Thus, when he repeated this consistent prediction of his, the media went wild with excitement, discarding the continuity of his forecast and presenting his belief that by the close of 2009 the recession would end as a surprise revelation. With business journalism like this, no wonder the Dow Jones is searching new highs even as employment numbers continue to plummet. What is noteworthy about Roubini’s most recent insights on the economic situation are their increasingly gloomy tone related to the mid-term and long-term prospects for the American economy. This is largely predicated on the growing fiscal imbalance in connection with the public indebtedness of the United States. Though a supporter of the vast deficit-driven stimulus programs and expensive bailouts of the financial sector owing to his belief that to negate these policy responses would have resulted in the collapse of the global financial system and the free fall contraction of the U.S. economy, Roubini is not unmindful of the their consequences. In that sense, he parts company from other advocates of deficit-creating economic stimulus packages, including Paul Krugman, who prefer to discard the danger of the vastly-expanding debt of the federal government. In addition to his concern about the ramifications of unprecedented levels of budget deficits, Roubini is also worried that the end of the recession he has long forecasted will now be only temporary, to be followed by a double dip recession during the latter half of 2010, interrupted by anaemic growth of less than 1%. This leads to what economists refer to as a “W” or double dip recession. In other words, the very policy responses politicians and their advocates claim are vital to restoring the economy may, by the end of 2010, become the principal enabler of forces that will unleash round two of the Global Economic Crisis. Nouriel Roubini had warned for years that the subprime mortgage sector would bring about financial and economic calamity, and take down much of the investment banking industry. Today we would all be wise to listen carefully to Professor Roubini’s warnings on the growing danger of a double dip recession and the long-term implications of a fiscal roadmap being pursued by our politicians that, in Roubini’s prescient words, is “unsustainable.” Given his track record, we can only discard the truth of which Roubini speaks at our peril. The speculation after the November presidential election was that Barack Obama originally wanted Bill Clinton’s former Treasury Secretary, Larry Summers, to serve in the same capacity in his administration. When criticism arose within his own party due to Summers’ strong ties to Wall Street, Obama selected Timothy Geithner as Treasury Secretary and appointed Larry Summers to serve as Director of the National Economic Council. In essence, Summers is serving as the principal economic advisor to President Barack Obama. In that role, Summers was undoubtedly one of the principal architects of the Obama administration’s so-called Economic Recovery Act, the $787 billion deficit-driven stimulus package that was supposed to put the brakes on the free fall in employment numbers in the United States. Increasingly, many critics, not all of them Republican, have raised serious doubts as to the efficacy of the Obama stimulus plan. However, the Obama team is not about passivity and turning the other cheek in the face of public doubts. They are pushing back, and taking the lead in connection with the stimulus plan has been Larry Summers. A far more relevant indicator of what is occurring with the real economy is the unemployment rate. Contrary to the declarations of the Obama administration that passage of the Recovery Act would stem the tide of job layoffs and stabilize the official unemployment rate at 8%, this sobering statistic has now increased to 9.5%, excluding the long-term unemployed and underemployed unable to find full-time jobs. All indications are that this number will exceed double-digits by the end of the year. The attempt by Larry Summers to utilize nonsensical data in defence of the core economic policy of the Obama administration in addressing the most severe economic contraction in American history since the Great Depression not only fails to reassure an increasingly uncertain public; it increases scepticism regarding the suitability of Larry Summers to serve as the White House point-person on the economy. Those who had pre-existing doubts regarding Summers due to his role in dismantling the Glass- Steagall Act ( which eliminated the longstanding separation between investment and retail banks, leading to the subprime implosion that sparked the current economic crisis) will see them reinforced by the bizarre rationalizations he is now increasingly resorting to in defence of the Obama administration’s economic policies. Perhaps we should not be surprised by the convoluted logic Summers invokes in support of his view of reality. After all, a major factor in his fall from the presidency of Harvard University was his “explanation” for why females were grossly under-represented in tenured academic positions in the sciences and engineering: “the different availability of aptitude at the high end,” according to Summers. Starting with Alan Greenspan as long-serving Fed chairman, and continuing with the likes of Rubin, Paulson, Bernanke, Geithner and now Summers, the public has been subjected to propaganda from the political establishment that presents those who have been selected to design our economic architecture as being brilliant beyond all measure. If we have learned anything over the past year, it is that these supposed geniuses of macroeconomic policy are in fact highly fallible. If nothing else, Larry Summers’ perplexing descent into meaningless trivialities suggests that this key economic policymaker is as detached from reality as most of his recent predecessors. Rather than being reassured by his reference to Google searches that bright rays of sunshine are about to dissipate the dark economic clouds hovering over the nation, I see Larry Summers’ ascendancy in the economic policymaking hierarchy of the Obama administration as the harbinger of a long recessionary winter which still lies ahead. Paulson’s statement, while superficially sympathetic to the injustice of the collective innocent paying for the sins of the few, is in substance the manifestation of a disdain for the broad masses that borders on contempt. In effect, he is reiterating a posture that has been consistently maintained by the “masters of the universe” since the onset of the global financial and economic crisis; privatize the profits (especially after radical deregulation) but socialize all losses. Since last fall, trillions of dollars have been added to the U.S. national debt through TARP, fiscal stimulus packages made necessary by the financial collapse, and other forms of direct and indirect government and Federal Reserve aid to the financial sector. All in the name, we are told, of the American people who, it is claimed, would be subjected to even greater debt and future taxation if Wall Street is not bailed out. The old concept of “moral hazard,” still in force when Paulson allowed Lehman Brothers, a competitor of his former stomping ground Goldman Sachs to die, was swiftly ejected when AIG faced bankruptcy. Now Goldman Sachs is declaring a record quarterly profit, and arrogantly boasting of the billions of dollars of bonus payments that will be dished out to its employees. What the firm that Paulson used to lead as Chairman won’t divulge is how much of its profit was due to $13 billion it received in payment from the U.S. taxpayer, using AIG as a pass-through for the payment. Neither will this Wall Street entity make public the impact of tens of billions of dollars in low-interest, taxpayer subsidized loans it now has access to, once Hank Paulson and Fed Chairman Ben Bernanke changed the rules, and allowed investment banks such as Goldman Sachs to magically transform themselves into bank holding companies. 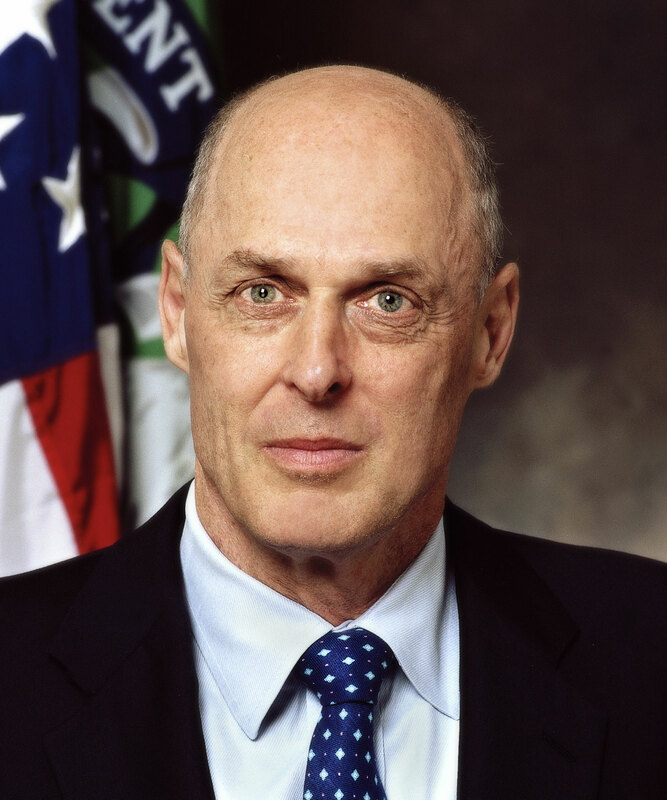 If Hank Paulson symbolizes the incestuous relationship between Wall Street and government, his attitude reflects how insignificant the general public has become in the minds of those calling the shots and making the critical policy decisions in the wake of the worst economic crisis to afflict the American people since the Great Depression. But when those who caused the disaster are spared the ravages of the unwashed masses who are now being corralled into ever-growing unemployment lines, and instead are basking in the illumination of near record bonus payments, their callousness can at least be understood. The question that Hank Paulson and his ilk may ultimately be compelled to answer is why should the American people be eternally grateful for their “noblesse oblige” when it becomes crystal clear to them that they have been dispossessed of much of their future as the price for bailing out Wall Street and its architects of our current economic and financial doom. Will China’s Economic Crisis Metastasize Due to Her Stimulus Spending? With a growing consensus by many observers that massive public borrowing by the U.S. and other major developed economies to fund economic stimulus programs has largely failed to stem the free fall in employment numbers and achieve its primary objective, it appears that the remaining hope of eternal optimists is China. In fact, the most hopeful projections of a return to global economic growth are based almost entirely on the Chinese economy. How ironic that the saviour of global capitalism is determined to be the largest Communist state still in existence. Indeed, the latest IMF forecast of a return to modest growth is predicated on the aggregate projected growth of the Chinese economy being sufficient to lift the net global growth figures for 2010. How realistic is this iconoclast faith in the capacity of China to lift the entire planet out of the doldrums of the Global Economic Crisis? In all probability, about as grounded in reality as U.S. Federal Reserve Chairman Ben Bernanke’s gospel of green shoots sprouting from the muck of financial and economic decay. We live in a surreal universe of economic analogies. Ben Bernanke has become a horticulturalist, preaching the botanical gospel of green shoots. Wall Street cheerleaders have displaced economic modeling with astronomy, peering through an opaque telescopic lens in search of enigmatic glimmers of economic light amid the nocturnal darkness of outer space. Policymakers are reassuring their anxious publics by becoming weathermen of financial forecasting, boasting of meteorological evidence that the economic storm clouds are abating. But strangest of all is the collective obsession of the economic establishment in much of the developed world with oriental soothsaying. They are reading tea leaves and breaking apart Chinese fortune cookies in order to fathom what direction China’s economic policy is headed, convinced that the old global economic order they are so desperate to revive and preserve depends on decisions being made in Beijing. The single most important policy decision made by China’s ruling circles was to enact an economic stimulus program of their own, totalling nearly $600 billion dollars. At first, desperate American and European economists and investors were fearful that the Chinese deficit-driven response to the Global Economic Crisis was not substantial enough. However, it is now recognized that as a proportion of GDP, China’s economic stimulus is by far the largest in the world. It is far larger than the Obama stimulus package, for example, when calculated as a proportion of the total national GDP. Furthermore, the Chinese are executing their response to the synchronized global recession at a much faster pace than just about any other economy, including the United States. On paper, the Chinese fiscal stimulus package appears to be bearing fruit. Projected growth rates for the Chinese economy in 2009 are currently predicted to exceed 7%. That figure alone is responsible for the overall negative global growth rate being forecasted by the World Bank not appearing even more sombre. No wonder so many policymakers and private financiers are looking gleefully at China’s economy as the global restorer of capitalism. When one looks beyond the manicured statistics, however, there appears a very dangerous side to China’s economic stimulus spending that may, in the long-term, make things much worse for China and the overall global economy. The Chinese economy was based on an economic model that is now exposed as fundamentally flawed. Essentially, China functions as the world’s factory, while its frugal citizens provided the savings that were transformed into credit that enabled U.S. consumers, in particular, to buy the output of China’s assembly plants. The financial tsunami and credit crunch that has afflicted the world has broken that model, reflected in the decline in Chinese exports from a year ago by 30%. In theory, the Chinese stimulus program is supposed to make up for the contraction in exports by boosting domestic demand, so as to arrest the rise in unemployment. However, a different dynamic appears to be underway in China. As dictated by the authorities in Beijing, staggering amounts of cash are being pumped into the economy. To illustrate the flow of capital being stimulated by China’s fiscal policy measures, in the first half of 2009 Chinese banks loaned $1 trillion. By way of comparison, in all of 2008 only $600 billion was provided to borrowers by China’s banks and financial institutions. With credit now flowing so free and easy towards Chinese companies, they are responding not by engaging in enhancing production and employment, but in rash speculation. In effect, the corporate sector in China is utilizing the stimulus money being doled out by Beijing to engage in speculation involving commodities, real estate and equities. In fact, Chinese companies are now establishing dedicated departments not focussed on the intricacies of marketing, sales, R & D and production, but on the sole task of speculating with the money being literally forced down their throats by China’s banks. Easy credit leading to speculation and asset bubbles seems to be the path China is embarked upon. Where have we seen this before? In the United States, as a result of the Alan Greenspan bubble, when the Fed set interest rates too low, setting the stage for the subprime mortgage collapse in the United States. As with deficit-driven stimulus spending elsewhere, China’s fiscal response to the economic crisis is a stop-gap measure, and cannot be continued indefinitely. What happens when Beijing halts the pump-priming and slows down the printing presses? A strong possibility will be the mother of all asset bubble deflations. The pundits who believe that China’s economic policies are the most important factor in the ultimate outcome of the current Global Economic Crisis may be correct, but in a manner that is an inversion of their hopes. Rather than rescue the global economy, China’s debt-induced credit fever may be setting the stage for an asset implosion of such severe intensity, it may be the final stage leading to an irreversible global depression. Larry Summers, Timothy Geithner and Ben Bernanke may be fated to go down in history as the three horsemen of the global financial and economic apocalypse. Though Fed Chairman Bernanke was inherited by the Obama administration, Geithner, Summers et al were the chosen economic team of the Obama administration. In effect, their selection was the single most important decision made by President Barack Obama in response to the Global Economic Crisis. Regrettably, thus far their performance has been found wanting. Most disconcertingly, many of their public statements are Bush 43 redux, a smorgasbord of overly-optimistic platitudes utterly dichotomized from economic realities. Perhaps the one phrase that is most likely to haunt the Obama administration is one uttered originally by Ben Bernanke in the spring; those perennial “green shoots” that the Fed Chairman could see sprouting amid the recessionary quicksand engulfing the global economy. Like a barbershop quartet, other senior Obama economic policymakers and advisors sang the happy melodies of these enigmatic green shoots. This happy talk was not without its effect; in large measure the bear market rally on Wall Street, what others have referred to as a “dead cat bounce,” was a by-product of investor optimism fuelled by the green shoots serenade flowing from the banks of the Potomac. As Yogi Berra would say, “it’s déjà vu all over again.” George W. Bush’s economic team was also full of joyful verbiage, until the floor literally collapsed from under them with the disintegration of Lehman Brothers. In the case of the Obama economic crisis management team, however, this theory of hope triumphing over reality has been executed with even more creative dexterity. With all credible mathematical indicators revealing that most of the largest U.S. banks are functionally insolvent, the Treasury Department concocted a totally cosmetic set of so-called “stress tests” to “prove” that these insolvent banks were, actually, “solvent.” In addition, by forcing changes in the FASB rules through political intervention, some of these banks were even able to show a profit in their Q1 results. The June unemployment numbers, however, are throwing a cold dose of reality in the direction of the pontificators of ephemeral green shoots. With the publicly released U3 Labor Department jobless report showing the level of U.S. unemployment having risen to 9.5%, and the less publicized but far more accurate U6 report showing actual unemployment and underemployment now at a staggering 16.5%, it is quite clear that the American economy, along with most of the planet, is still undergoing a painful contraction. The fact that one in six Americans is either unemployed or trapped in low-paying part-time employment due to the lack of full-time positions, is a far more significant economic indicator than short-term gyrations on Wall Street or periodic upward anomalies confronting an otherwise downward economic trend. Amid all the green shoots fantasizing, it must be recalled that the United States economy depends on the spending of the U.S. consumer for more than 70% of its aggregate demand. The real significance of rising unemployment, exchanging full-time jobs for part-time employment and the fear factor inhibiting spending by those who think they may lose their jobs, is a radical contraction in consumer spending. It is this reality more than any other that is weighing heavily on the nation’s economic superstructure. Not only is joblessness rising. After years of American consumers spending more than they earned, they have now shifted radically towards a high level of savings. Transitioning from a negative savings rate, the U.S. wage earner now banks nearly 7% of his/her declining take- home pay, despite virtually zero interest being offered to savers due to the Federal Reserve’s zero interest monetary policy. The American consumer is scared, and is not being seduced by talk of green shoots emanating from Washington. With consumer spending undergoing significant contraction not only in the United States but in virtually all major economies throughout the globe, increasing pressure will bear on securitized investments based on loan portfolios directly or indirectly linked to consumer spending. Retail and shopping mall mortgages will witness higher levels of defaults, in conjunction with the already virulent afflictions hammering sub prime and prime residential mortgages, commercial office space mortgages, consumer loans and credit card debt. The Obama administration apparently believed that the original $700 billion TARP Wall Street bailout passed by Congress in the last weeks of the Bush administration, and President Obama’s $800 billion stimulus spending bill, would suffice to stabilize the economy and put the brakes on the free fall in employment numbers. However, jobs are still being shredded each month by the hundreds of thousands, while banks still suffer from balance sheets saturated with toxic assets. The FDIC has already closed more U.S. banks this year than in all of 2008. As I indicated in a recent piece, there is already serious discussion occurring in the corridors of power in Washington on the necessity of a second stimulus spending package. This is an acknowledgement that the Obama economic crisis team, thus far, has been an abject failure. However, with so much money already having been borrowed by the U.S. government on a variety of schemes supposedly aimed at saving the economy, further large doses of public debt bring along very dangerous negative implications of their own. Mohamed El-Erian is not offering green shoots, but he does speak the truth. Unfortunately, the truth is so bitter, it is unlikely that President Obama’s principal economic advisors will face up to the harsh and even brutal realities of the Global Economic Crisis until it is far too late for any policy response to be effective. No more revealing metaphor can exist for the distortion of mass culture than the media-induced frenzy over the demise of Michael Jackson. One would think there is no Global Economic Crisis, or unending wars in Iraq and Afghanistan, not to mention dangerous nuclear proliferation in North Korea and Iran, which could spark a world war. No, as far as the mass media of the planet, and especially corporate media in the United States are concerned, the death of the pop music icon, Michael Jackson, was an unheralded business opportunity. Though the dead freak-show that was Michael Jackson is being proclaimed as the “King of Pop” by sycophants and marketers, this spectacle has nothing to do with high art and musical culture. The late Mr. Jackson was no doubt a talented musical artist. But no more so than many others who are active in the music industry. His good fortune was to have had the marketing machine that created the Michael Jackson “brand,” in effect the commoditization of this tormented and unbalanced soul. However, even setting aside the peculiarities and accusations involving Michael Jackson, he was no Beethoven or Mozart. Neither would I rank him in the realm of Tchaikovsky or Dvorak. He in no way can even be remotely compared to the giants of music of the classical period. Even within the realm of 20th century music, Michael Jackson pales before the sheer genius of Duke Ellington, Count Basie or the torrential musical perfection embodied by a Frank Sinatra. Yet, based on the media frenzy, one would think he rivalled Ludwig van Beethoven as a seminal figure in musical historiography. What we are witnessing is the fabrication of a celebrity legend, which will in effect become the new, post-death Michael Jackson brand. Necrophilia is an inseparable element of this rebranding process, witnessed by the ghoulish non-stop worldwide television coverage of the shrouded corpse of Michael Jackson being airlifted to the Los Angeles county morgue. However, this was merely the prelude to the global media circus that infused the public memorial for the deceased entertainer. His remains secured in a golden casket, celebrity upon celebrity heaped praise upon Jackson as though he was the most pivotal human being of the age. There was a discordant Stalinist character to this contrived hero-worshipping of a man once indicted on a charge of child molestation. Here was the new cult of personality, whereby a flawed human being becomes the most perfect and consequential of mortals. We have seen and criticized this behaviour in North Korea, where the dictator, Kim Jong-Il, is proclaimed by state propaganda as an infallible genius worthy of mass adulation. How then is this media-manufactured hero worship of Michael Jackson any different? At best, the media frenzy over the mortification of Michael Jackson is a severe distraction from the real and critical problems confronting the human race in the first decade of the twenty-first century. At worst, the obsequious tributes to this bizarre life now ended are a dark manifestation of a civilization anticipating its own implosive ending.